Behind all the nice photographs and cheesy jokes, this blog has just two primary objectives. The first is to show you what a glorious time I’m having eating my round around London and the wider world! The second is to give you my reasoned opinions on where and where not to dine. Unfortunately this review, unlike almost all the others here, will fail that second objective – by the time you read this, the M. Wells restaurant will have closed due to landlord issues and that’s very sad. I stumbled upon M. Wells on its closing night purely by accident. M. Wells was housed inside an old Fifties-style diner located incongruously on a gritty-looking Queens street lined with old warehouses. Since it was the final night, the atmosphere was more like that of a house party than a restaurant which was undeniably fun, but it also meant the service was a little slapdash at times. Although it was a diner, complete with a counter and stools as well as booths, its menu was completely different from other American diners I’ve come across. For example, you’re unlikely to come across a salad of beef tongue, fava beans, pickled onion and baby potatoes at your average roadside diner. 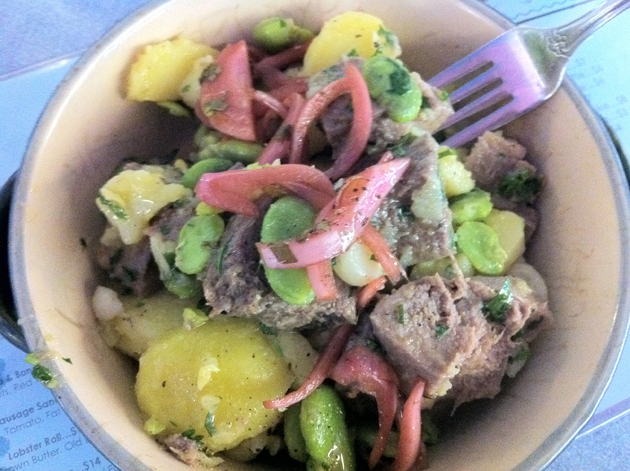 The meaty chunks of tongue were soft with a nicely dimpled texture, while the firm fava beans provided a contrast in texture. Most of the flavour came from the tartness of the pink pickled onions, but overall it’s not a bad way to start a dinner although it’s large enough to be a meal in of itself. This is considered a 'small' dish. 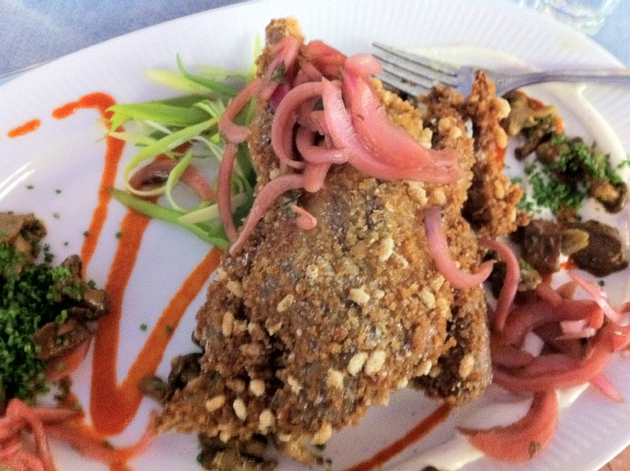 Another intriguing dish is the fried chicken. The dark juicy meat has a crunchy coating occasionally studded with rice krispies! Although slightly gimmicky, the bits of cereal do add a certain sweetness and another layer of crunchiness to the remarkably oil-free coating. The juicy, nutty mushrooms accompanying the chicken are given extra flavour by the tart pickled onions and creamy mayo. Rice krispies fried chicken. Only half as crazy as it sounds. The ironic thing about the beef tongue salad and fried chicken is that, according to the menu, these are ‘small dishes’! The significantly larger ‘big dishes’ are truly enormous – the burger, which I wished I had photographed, is literally the size of a child’s set of stacking rings. One small dish that is actually small is the tender chunks of raw tuna. The garlicky egg yolk sauce has a wonderfully tart, tangy, moreish flavour – a fine accompaniment to the silky fish encrusted with crushed capers. 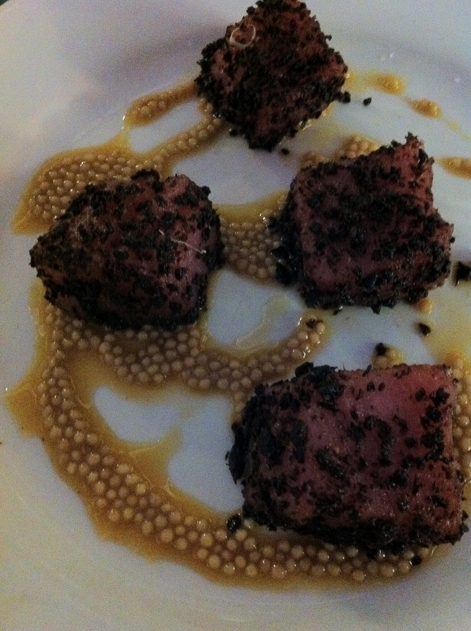 Lee Perkins tuna at M Wells. Who is this Lee Perkins anyway? Sadly, the dessert was the weakest dish of the evening. 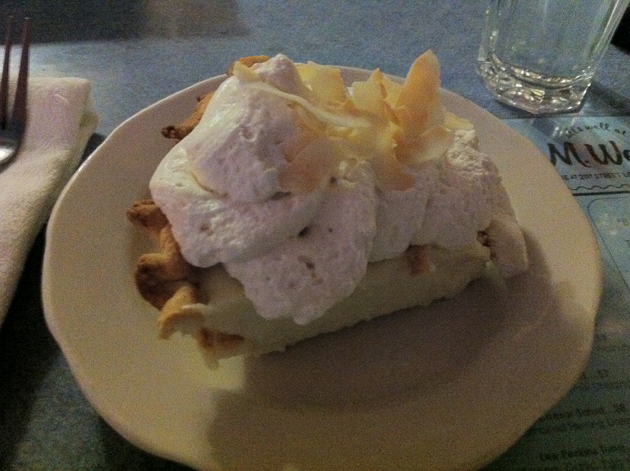 The coconut cream pie was suitably light and fluffy, but also lacking in actual coconut flavour. The thin, crispy, slightly buttery but otherwise bland pastry was not only very unsatisfying, but also a little misjudged. Something more substantial was needed to balance out the wispiness of the coconut cream. No cream pie jokes will be tolerated. Although by no means perfect, it’s still sad that M. Wells is no longer open. The quirky, inventive food from Montreal chef Hugue Dufour is often a joy to behold, although the portion sizes are hilariously misjudged, even by American standards. If and when Dufour opens a new eatery, I hope to be one of the first in line. Total cost for one person including soft drink, but excluding tip: $60 (approx. £37 at time of writing; you would have paid less if you are less of a glutton than I am). Tags: beans, coconut, diner, fried chicken, m wells, new york, onions, pie, potatoes, restaurant, review, salad, tongue, tuna. Bookmark the permalink. Previous post ← Dinner by Heston Blumenthal review – overrated?